Hall of Fame jockey Edgar Prado served as Honorary Postmaster during the annual Alibi Breakfast Thursday morning inside the Terrace Dining Room at legendary Pimlico Race Course, where he was also recognized for reaching a historic milestone this week. 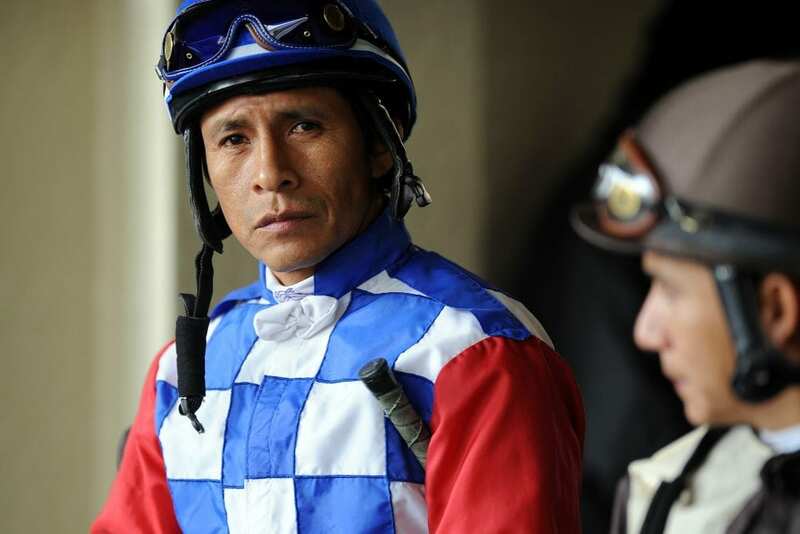 Prado, who turns 51 June 12, became just the eighth rider in Thoroughbred history to win 7,000 races joining Russell Baze (12,842), Laffit Pincay Jr. (9,530), the late Bill Shoemaker (8,833), Pat Day (8,803), David Gall (7,396), Chris McCarron (7,141) and Angel Cordero Jr. (7,057) in the elite club. The Peruvian native's breakthrough victory came aboard Anthony Merlino's homebred colt Thefundsarelow in Tuesday's sixth race at Parx Racing in Bensalem, Pa. Prado was presented with an etched crystal trophy for his achievement by Maryland Jockey Club President and General Manager Sal Sinatra. Members of Maryland's jockey colony are scheduled gather in the Pimlico winner's circle to honor Prado following Friday's $100,000 Skipat Stakes. Since 1996, the United States Post Office has opened a temporary Preakness station the week of the Preakness. Past honorary postmasters have included Hall of Fame trainers Bob Baffert, D. Wayne Lukas and Nick Zito, champion horses Cigar and Ben's Cat, and the Thoroughbred Aftercare Alliance. Prado came to the U.S. in 1986 riding in South Florida and New England before rising to prominence in Maryland with 24 riding titles from 1991 to 1999. He led the country in wins from 1997-99 including an incredible 535 in 1997 before moving his tack to New York. “Maryland has been great to me for so many years,” Prado said. Prado returned to riding regularly in Maryland in the spring of 2016 at Pimlico. Among his many career highlights are victories in the 2006 Kentucky Derby (G1) aboard Barbaro, two Belmont Stakes (G1) and five Breeders' Cup races. Represented by Bob Klesaris, a former leading trainer in New York and New England with more than 2,200 wins from 1976-2007, Prado was inducted in the National Museum of Racing's Hall of Fame in 2008. He won the Eclipse Award as the nation's leading jockey in 2006. The Alibi Breakfast traces its origins to the late 1930s when a group of trainers, owners and greater and lesser dignitaries would gather in the mornings on the porch of Pimlico's historic clubhouse to expound upon the merits of their horses. Today, the event features a gathering of media, owners, trainers, jockeys and horsemen to celebrate the Preakness and solicit interesting race predictions. Among Prado's mounts this weekend are multiple graded-stakes winner Something Awesome in the $300,000 Pimlico Special (G3) and stakes-winning filly Limited View in the $150,000 Adena Springs Miss Preakness (G3), both Friday. This entry was posted in People and tagged 2018 preakness, alibi breakfast, edgar prado, honorary postmaster, Jockeys, pimlico by Press Release. Bookmark the permalink.